One of Chloe’s pre-molar was in such a bad state it was wobbly and her first dentist said it had to come out. Chloe made a date for it to be extracted but on her Mum’s advice, decided to get a second opinion. She went to the practice where Jamie Nelson works. He agreed that the tooth was in bad shape but said he would do his very best to save it with root canal treatment. And he did! The tooth now feels strong and healthy and the bone that had been lost underneath the tooth has grown back. 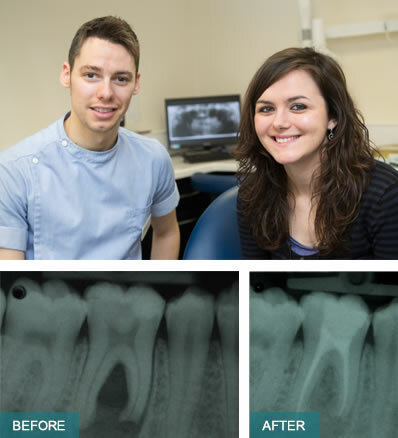 The case made Jamie the winner of the Young Dentist Endodontic Award in 2013. Chloe is now Jamie’s patient and very grateful she went for a second opinion. Do you want to make a comment, add your support or have a query? Email us.